The Syracuse Chiefs are kicking off their 2017 season with a weekend full of fan-favorite traditions as well as new and exciting promotions for the entire family! These fan-forward experiences once again prove the Chiefs are the premier destination for affordable family fun in Central New York. 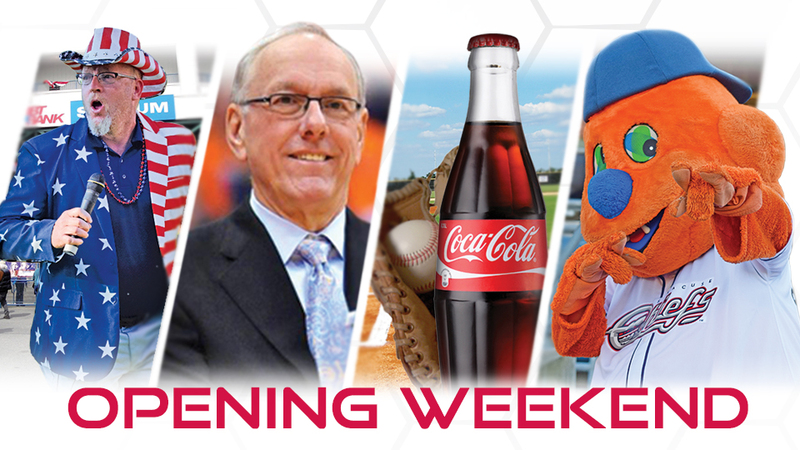 "There's nothing better than the return of baseball season," said General Manager Jason Smorol, "and there's no better way to celebrate than with family, friends, and the Chiefs on Opening Weekend!" Opening weekend kicks off with the Chiefs' Opening Day celebration, presented by Fidelis Care. The first game of the 2017 season brings back the exciting 53° or FREE Guarantee. To double down on the festivities, Smorol challenged Red Wings general manager Dan Mason and guaranteed a Chiefs win on Opening Day. For more information about the challenge, visit http://atmilb.com/2mVM7XO. Ultimately, fans may exchange their Opening Day ticket for a ticket of equal or lesser value to any Chiefs home game in April or May if the temperature fails to hit 53 degrees by first pitch on Thursday and/or the Chiefs defeat the Red Wings. In addition, the general manager of the losing team will have to travel to the opposing team's stadium, wear a team T-shirt and lead fans in the national anthem at a later date during the season. Thursday also features pre-game Opening Day ceremonies, plus the season's initial $1 Thursday, presented by 95X. Every Thursday this season, fans can enjoy $1 Hofmann hot dogs, $1 Coca-Cola fountain drinks and $2 Saranac, Labatt, Coors and 1911 hard-cider products. For the season's first night game, the Chiefs will honor a local legend with Jim Boeheim Added-Value Night sponsored by OCRRA. In response to the Greensboro Grasshoppers' Jim Boeheim (No) Value night, the Chiefs will recognize Boeheim's contributions to the community in a night meant to honor the Hall of Fame coach. Boeheim and his wife, Juli, will be on hand to throw out the ceremonial first pitches before the game. Promotions include a T-shirt giveaway to the first 1,004 fans (to honor Boeheim's 1,004 career wins), a Jim Boeheim look-a-like contest and free admission for fans with a valid North Carolina ID. In addition, the Chiefs will donate portions of the night's 50/50 raffle and ticket sales to the Jim & Juli Boeheim Foundation. Friday doubles as the season's first Fireworks Friday, presented by 93Q, with a postgame fireworks spectacular. Finally, National Beer Day specials are on tap at the concession stands with a 2-for-1 beer deal. The Chiefs will kick off the weekend with Catch and A Coke Day sponsored by Coca-Cola on the first Super Saturday of the season. The afternoon matinee will feature a Chiefs 2017 Magnet Schedule giveaway for the first 4,000 fans in the stadium and after the game, Chiefs fans can take to the diamond for a Meet the Chiefs autograph session and the season's first postgame catch on the field all courtesy of Coca-Cola. Opening Weekend concludes with their brand-new Kids Eat Free on NBT Bank Family Sunday presented by The REBEL 105.9! Kids 12 & under will receive vouchers for free food including a popcorn and Coca-Cola fountain drink (1st inning), a Hofmann Hot Dog and Coca-Cola fountain drink (3rd inning), and a Perry's Ice Cream cup (7th inning). As always, kids can run the bases after this and every Sunday game in 2017 thanks to St. Joseph's. 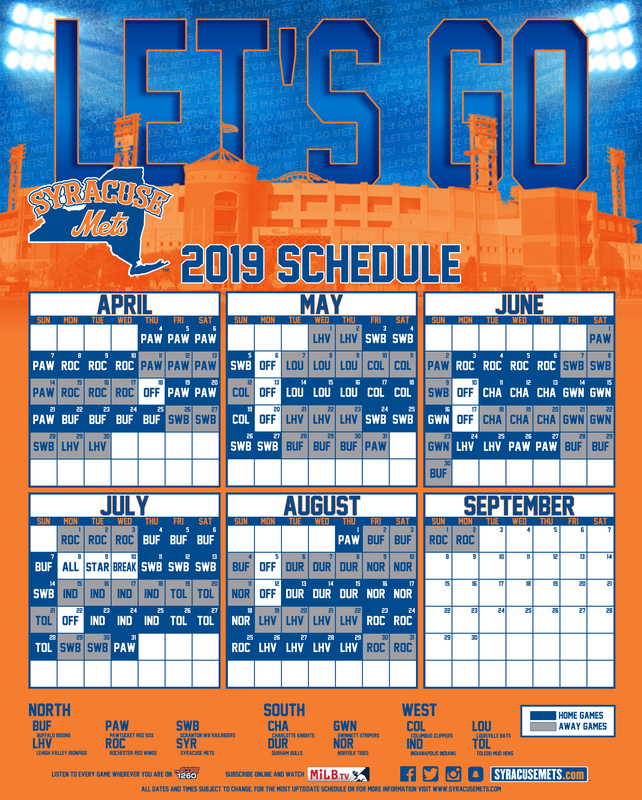 To purchase tickets for any of the highlighted days above or any Chiefs home game this season, please visit www.syracusechiefs.com/tickets, contact the Chiefs' ticket office at (315) 474-7833, or stop by NBT Bank Stadium during normal business hours, Monday to Friday, 9 a.m. to 5 p.m.
More information about Chiefs promotions can be found by visiting syracusechiefs.com, or by emailing Manager of Community Relations and Promotions Kyle Fussner at kyle@syracusechiefs.com or by calling (315) 474-7833.